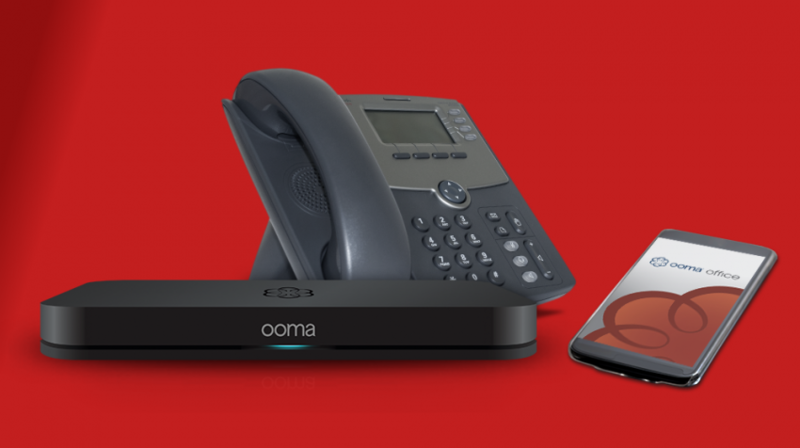 Ooma Office is a complete small business phone system that offers a virtual receptionist, conference call hosting, multi-device access, number porting, and much more; all at a price your small business can afford. Even though 60 percent of online traffic in 2014 and 56 percent of top retail searches in 2016 came from mobile devices, mobile calls to businesses continued to grow, reaching 85 billion calls annually in 2016. 59 percent would call because they’re looking to get a quick answer while 57 percent want to talk to a real person. Customers are more likely to call when making a high-value purchase, especially in verticals such as auto, finance, or travel. Given these numbers, your small business can’t ignore the phones. 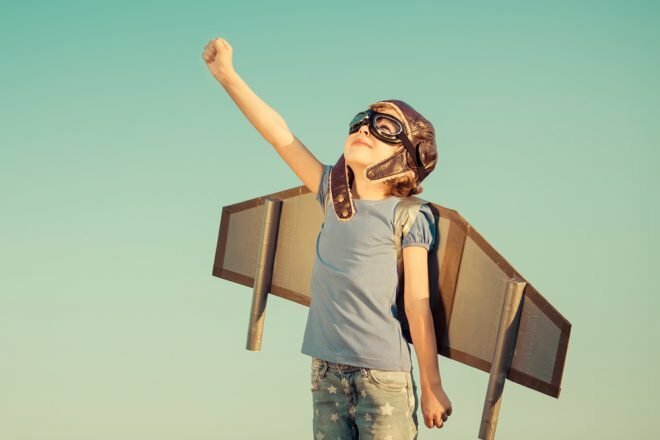 And, when customers do call, you need to ensure that their experience matches their expectations. That’s where Ooma comes in. Getting started with Ooma Office is straightforward and fast. The company will ship your equipment along with a customized “Quick Start” booklet that knocks off certain steps, such as setting up your online administration account, if they’ve already been completed. Once you connect the Ooma Base Station to your network, you can add both digital and analog phones to the system. Using an Ooma Linx, you can even connect existing analog phones without using wires. And, if you use IP phones, you can skip the base station altogether and go “cloud-only”. No matter your equipment, the whole system is managed via an online administration portal. Here, you can add, remove and manage extensions and users. You can also manage the many features that come bundled with Ooma Office. Ooma Office is chock-full of features, most of which are included in the regular low price of $19.95 per user per month. Ring a specific user: If you have a dedicated receptionist, you can direct all incoming calls to their phone. Ring a group of users: If you do not have a receptionist, but want to have all calls answered by a person, you can route incoming calls to a “ring group”. The person who answers first then handles the call. 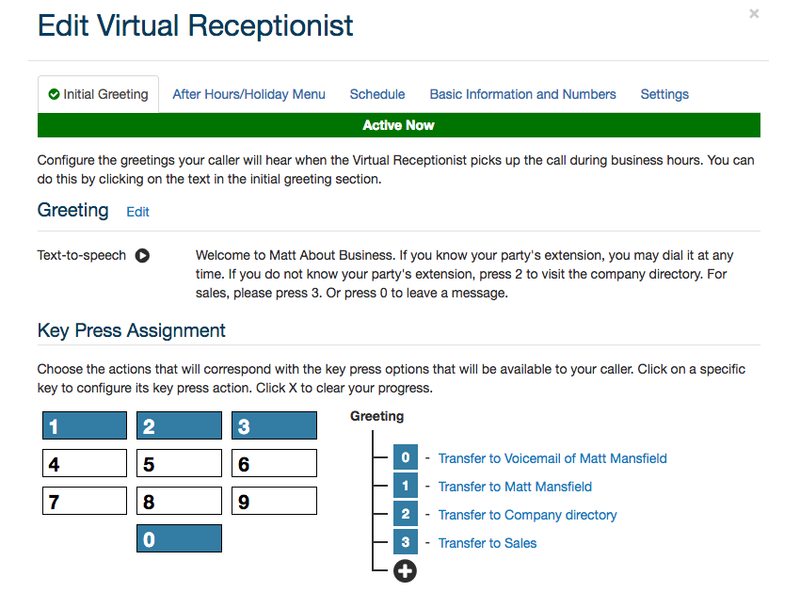 Use a virtual receptionist: As shown below, the virtual receptionist lets you set up a message (either text-to-speech or a voice recording) that routes calls based on the key press options you set. In addition to the default greeting and key press assignments shown above, you can set both a regular and holiday schedule during which the “After Hours/Holiday Menu”, with its own greeting and key press assignments, is used instead. This feature lets you assign specific extensions (e.g. 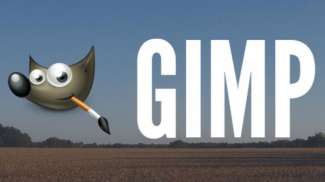 everyone in sales) to one group. When that group is called, either through an assigned direct number or via the virtual receptionist options (key press 3 as shown above), those extensions are rung. Depending on your needs, they can all ring at once or sequentially, one by one. The virtual fax feature makes it easy for you to both send and receive faxes. You can send PDF or TIFF faxes using the web portal. Received faxes are forwarded to your email, which means you get them anywhere, at any time. If your small business holds a lot of conference calls, you’ll like this next feature. You can create up to 10 conference rooms, each with its own direct call-in number and optional PIN. The conference lines can be used at the same time by up to 10 people each. While your customer is on hold or being transferred, you can play an audio file for them. This file can be music or a recorded message about your business, its offerings, and any specials you’re running. If you already have a business phone number, Ooma for business lets you port it to your new small business phone system for free. That way, your existing customers can keep using the number they know and you won’t have to change any of your advertising, business cards or other collateral. The Ooma Office package includes one toll-free number for your small business to use. The number comes with 500 free inbound minutes per month. Additional minutes are charged a usage rate. Ooma for business offers a mobile app for both iOS and Android phones. This app gives your mobile phone many of the same features as your desk phone including caller ID which shows your business number and the ability to transfer calls to other employees. In addition, you can make all your devices ring at once, so you won’t miss a call no matter where you are. Lastly, you can do all this over WiFi, saving your mobile minutes for other uses. Personal voicemail, accessible both in and out of the office and including voicemail audio email attachment functionality. This is where Ooma Office really shines. You get all the features listed above, as well as unlimited outbound calling in the U.S. and Canada, for $19.95 per user per month. There are no contracts. Billing is month-by-month. Additional costs include one time hardware purchases for the Ooma Base Station and any phones or Linx units, if needed. Also, direct-call lines for features like ring groups and second lines for existing users are billed at $9.99 a month. Finally, international calls are billed using rates as low as Ooma can secure. Ooma Office is an easy to install and manage small business phone system. 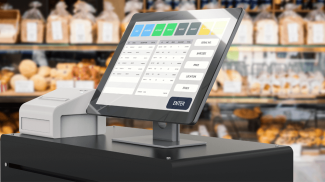 It’s priced affordably for small businesses and is robust enough to handle your needs. In addition, Ooma offers 24/7 customer support, a lifesaver for busy small business owners. Last but certainly not least, Ooma for business is scalable, able to grow with your company, both in terms of features and costs. Now that you know all about Ooma Office, if you’d like to learn more simply fill out the form on this page. Interesting. I guess this is a good first step into your customer service. 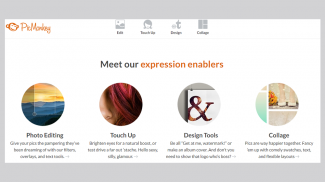 This is great for small businesses who want to improve their communications with their customers. I like that it is not as expensive as the other options. Back then, setting something up as complicated as this will realy be expensive. It is really nice that we have these options todfay. This is a valuable piece of asset for small businessman. Who relies on client calls and follow-ups over the phone.